Argostoli (Greek: Αργοστόλι, Katharevousa: Ἀργοστόλιον) is a town and a former municipality on the island of Kefalonia, Ionian Islands, Greece. Since the 2011 local government reform it is part of the municipality Kefalonia, of which it is a municipal unit. It has been the capital and administrative centre of Kefalonia since 1757, following a population shift down from the old capital of Agios Georgios (also known as Kastro) to take advantage of the trading opportunities provided by the sheltered bay upon which Argostoli sits. Argostoli developed into one of the busiest ports in Greece, leading to prosperity and growth. The municipal unit has an area of 157.670 km2. The 2011 census recorded a population of 10,633 in the Argostoli municipal unit. Its largest towns are Argostóli (pop. 9,748), Razata (507), Dilináta (496) and Kompothekráta (449). To the east of Argostoli, at the end of the bay, beneath the aforementioned Castle of St. George, sits the Koutavos Lagoon, a feeding ground for the Loggerhead turtles (Caretta caretta). Now a nature reserve, the Koutavos Lagoon was once an almost impassable swamp where mosquitoes and malaria were rife. Under the British governor of the island, General Sir Charles James Napier, a wooden bridge was constructed across the lagoon in 1813 by Colonel Charles Philip de Bosset, a Swiss engineer in the employ of the British army. Four years later stone arches were added and, after some 26 years, the entire bridge was rebuilt in stone. In continuous use until 2005, this narrow bridge is now closed to traffic, currently undergoing renovation by the Greek Ministry of Culture. Almost halfway along the De-Bosset Bridge stands a stone column built by the British to celebrate their presence. The coastal road out of Argostoli to the west was known during the Venetian period as the ‘Piccolo Gyro’. Along the Piccolo Gyro, in the Vlikha area facing Lixouri, lie the ‘Swallow Holes’ of Katovothres, a geological phenomenon. Sea water disappears underground and travels under the island, re-emerging around fourteen days later in the Karavomylos area of Sami, having passed through the nearby, underground Melissani lake. The power of this sea water was harnessed, in 1835, to power a water mill. Further along the Piccolo Gyro is the Agion Theodoron lighthouse, named after the small adjacent church. More commonly known as the Fanari lighthouse, this too was built during the British occupation, in 1829. The original building was destroyed in the earthquake of 1953, the recently restored present structure was rebuilt, complete with Doric-style columns, from the original plans. 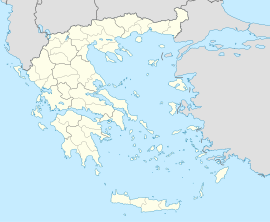 Buildings that weren't shattered by German bombing in 1943 were destroyed in 1953 by the earthquake that razed virtually all of Kefalonia, apart from the Fiskardo area, to the ground. Opposite the Archaeological Museum of Argostoli are the law courts, originally constructed by the British with stone from the Cyclopean site at nearby Krani. Along Lithostroto, next to the Catholic Church, is a tiny museum (open some mornings and most evenings) dedicated to the soldiers of the Acqui Division. A little further along is the Bell Tower, rebuilt in 1985 to house the original clock mechanism. Between the Koutavos Lagoon and the De-Bosset Bridge is the new bus station which connects Argostoli with the other towns and some of the villages on the island, as well as with Athens and Patras. The old bus station, just past these market stalls, is likely to accommodate a proposed seaplane service connecting Argostoli with Patras, due to commence Spring 2006. The main ferry port, connecting Argostoli with the mainland (via Kyllini) and Zakynthos (also known as Zante) is next to this building with the Lixouri ferry (once an hour in winter, twice an hour in summer) docking a little further along. Statue of Panayis Athanase Vagliano, merchant and shipowner from Cephalonia, in Argostoli. ^ "Kefalonian Buses - 11/9 – 30/9/2018". www.ktelkefalonias.gr. Retrieved 2019-01-25. Wikivoyage has a travel guide for Argostoli. Wikimedia Commons has media related to Argostoli. This page was last edited on 28 January 2019, at 17:58 (UTC).